It is a great feeling to solve a problem correctly, but even better to take more than just the raw solution from it. Here, in what is a simple problem, I stared for some minutes trying to decide between Qxh3 and Rxf3, but unable to choose one, the other or something else, I took a break, came back and actually thought about what I was trying to achieve. As soon as I did that for each move, it was simple. 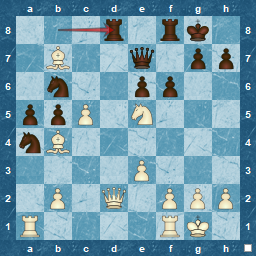 "Qxh3 forces Kg1, which must be good" , but instead of saying " what move is next", it is so much better to visualise the final mating position ( Qg2 will mate the King ), and doing this gives an instant answer of how to get there, with some minimal calculation afterwards to prove the solution. Something similar below, in what appears to be a scary position for White, who has 4 pieces under threat, including the Queen ! There are many moves that present themselves, and calculating some of the obvious and initial ones, left me stuck. 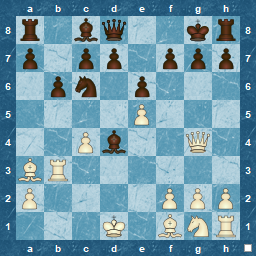 For example, cxb3 threatens the Queen as well as taking a piece, but is met easily by either Qxb5 or even Qxb7. Playing c6 to protect the Bishop on b7 and attack the Queen seems better, but Black responds easily to this as well. 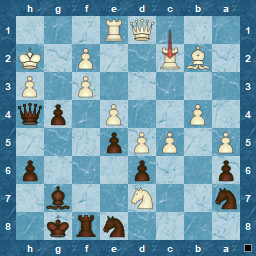 Nc6 forks the Queen and Rook, but the response of Rxe2 seems to offer Black a way out. 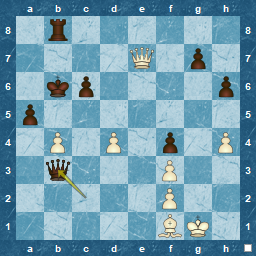 So here, as well as verbalising the threats and position, because White is experiencing so many threats, the active moves need to both rescue White pieces and threaten Black, preferably with multiple, or stronger, threats on each move. As always, Chess is a straightforward and very logical game, but achieving this over the board in game conditions is not always easy to do ! As a final note, checking the full game of the last problem, just to see what was actually played in the game, it was somehow nice to see that White was not a super GM, but rather an enthusiastic IM called Cenek Kottnauer, a Czech player who emigrated to England in the 1950s. Not only did he find the correct combination, going on to win that game from 1946, but he also achieved a rare thing in a later tournament in that he won all his games (9 of them) in the 1961 Beverwijk Masters, now known as the Tata Challengers tournament in Wijk-aan-Zee. An obituary from William Hartston reveals a bit more about the man. "Despite these fine results, many will remember Cenek Kottnauer most fondly for the evening classes he gave at Morley College in London, when he would walk round demanding, not better chess from his class, but greater signs of emotion and enjoyment. If he did not hear shouts of joy and anguish and the crash of pieces being banged down, Kottnauer felt his pupils were not entering into the true spirit of the game. He was never quite able to transplant the fervour of Prague coffee-house chess to south London, but he did teach his colleagues in the English team a great deal about self-discipline and commitment"
Difficult to argue with enjoyment, self-discipline and commitment, in chess or any other part of life. Examples like this should be burned into my brain, branded onto my left forearm, so I see it whenever I check the time. Overall, 64% of those who attempted it failed, which is quite something for a problem that appears very straightforward. I'm sure you, dear readers, will not fail, since there is a big hint here, but spare a thought for those who did, and remember that pawns are more than the soul of the game, but are active players in their own right ! Probably harkening back to this recent post and a much earlier one, I paid too much attention to the exposed king, which was acting like a beacon to me. 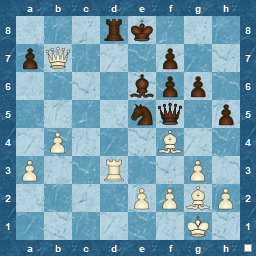 I did think of an alternative, but the initial moves of that didn't seem to work, so I gave it up and went back to the focus on combinations around the King, such Rxd1 or Bxe5 to remove a defender, but these just would not work. I needed the Queen out of the way so she did not add protection to the d2 square, allowing Bc6. Returning to one of the alternatives that I had dismissed, which was about pushing the Queen out of the way, I took the calculation further, and the answer was simple, and not to do with an attack on the king. So, too much time spent on this, 10 minutes compared to the average of 5:38, but happy to know that I realised the king attack was not working and actively looked for something else. ...and maybe a chance to resurrect some more Focus? 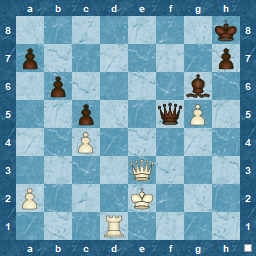 A sweet problem that feels, initially, that its not quite resolvable, until you see the issues in the defence for Black. I saw the problem with the Bishop interposition quite early, but it took me another set of calculations to see why interposing the Queen is also a failure. It always intriguing to see what line the computer will choose, and in this case it went for the game line.